The plot I hope to purchase #gettingcloser has a drain running through it at the back (was laid in the 70's) but the previous owner was too tight to get it connected, it transpires he was too tight to get his septic tank cleaned out also but that's another story, I digress anyway on investigating over the weekend I measured that the drain is just over 6ft down, any ideas on the way I'm going to have to connect. sorry that was no help but it made me chuckle. I did'nt think that you were allowed to KASPLOSH. I think your connection branch is going to have to go "Down, down, deeper and down" and join up with the existing at the bottom. Why when I see that does the phrase "long drop" spring to mind? Yep... and could use a backdrop and cut into the pipe at the bottom. @Danny68 is it a live drain ..? Assuming it has flow from somewhere else ..? 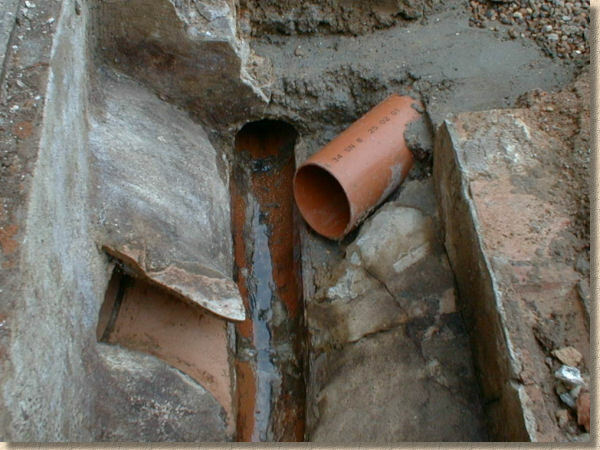 If it’s definitely a foul drain then 6ft down is an easy job to do - connect before the manhole. Technically it should have a restrictor set on it - has it got a cast lid ..? Yes, it's a live drain and pretty sure the previous chap didn't connect and if he did he's done it illegally and without any manholes, until I finally get my hands on the keys I won't be able to chuck some tissue down and flush the toilet to see if it is . Has got a light weight cast lid its in the back garden so only foot traffic. Connect before the manhole 6 inch branch reduced down n to 4 Is that correct ? However I don't see an existing branch connection down your manhole hole. Have a look down any others to see if there is a spare you can use. Thanks for all the replies, And great illustration of the drop shaft. I don't believe there's any other manholes on the site and I imagine that because the chap declined mains drainage the water company didn't bother putting any capped access branch in place for future use. The pipe coming in top right is wrong. Should be a channel with neat smooth benching. There are too many areas for solids to lurk. Maybe this was a "during construction" picture? I am not sure that it is big enough for access. Maybe only 450 x 600 which is too small to work in. It may need proper rings. Just thinking, possibly drop new man hole in line plastic jobby with access branch then drop shaft ?